Actinium is a radioactive chemical element with symbol Ac (not to be confused with the abbreviation for an acetyl group) and atomic number 89, which was discovered in 1899. It was the first non-primordial radioactive element to be isolated. 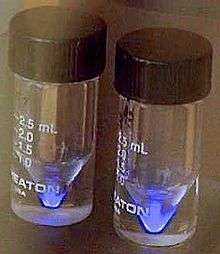 Polonium, radium and radon were observed before actinium, but they were not isolated until 1902. Actinium gave the name to the actinide series, a group of 15 similar elements between actinium and lawrencium in the periodic table. 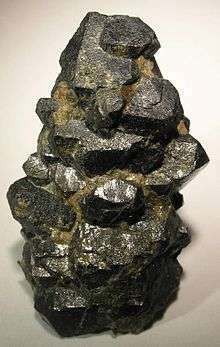 It is also sometimes considered the first of the 7th-period transition metals, although lawrencium is less commonly given that position. Articles published in the 1970s and later suggest that Debierne's results published in 1904 conflict with those reported in 1899 and 1900. Furthermore, the now-known chemistry of actinium precludes its presence as anything other than a minor constituent of Debierne's 1899 and 1900 results; in fact, the chemical properties he report makes it quite likely that he had instead accidentally identified protactinium, which would not be discovered for another fourteen years, only to have it disappear due to its hydrolysis and adsorption onto his laboratory equipment. This has led some authors to advocate that Giesel alone should be credited with the discovery. A less confrontational vision of scientific discovery is proposed by Adloff. He suggests that hindsight criticism of the early publications should be mitigated by the then nascent state of radiochemistry: highlighting the prudence of Debierne's claims in the original papers, he notes that nobody can contend that Debierne's substance did not contain actinium. Debierne, who is now considered by the vast majority of historians as the discoverer, lost interest in the element and left the topic. Giesel, on the other hand, can rightfully be credited with the first preparation of radiochemically pure actinium and with the identification of its atomic number 89. 1 2 3 4 5 6 Kirby, Harold W.; Morss, Lester R. (2006). "Actinium". The Chemistry of the Actinide and Transactinide Elements. p. 18. doi:10.1007/1-4020-3598-5_2. ISBN 978-1-4020-3555-5. ↑ Debierne, André-Louis (1899). "Sur un nouvelle matière radio-active". Comptes rendus (in French). 129: 593–595. ↑ Debierne, André-Louis (1900–1901). "Sur un nouvelle matière radio-actif – l'actinium". Comptes rendus (in French). 130: 906–908. ↑ Giesel, Friedrich Oskar (1902). "Ueber Radium und radioactive Stoffe". Berichte der Deutschen Chemische Geselschaft (in German). 35 (3): 3608–3611. doi:10.1002/cber.190203503187. ↑ Giesel, Friedrich Oskar (1904). "Ueber den Emanationskörper (Emanium)". Berichte der Deutschen Chemische Geselschaft (in German). 37 (2): 1696–1699. doi:10.1002/cber.19040370280. ↑ Debierne, André-Louis (1904). "Sur l'actinium". Comptes rendus (in French). 139: 538–540. ↑ Giesel, Friedrich Oskar (1904). "Ueber Emanium". Berichte der Deutschen Chemische Geselschaft (in German). 37 (2): 1696–1699. doi:10.1002/cber.19040370280. ↑ Giesel, Friedrich Oskar (1905). "Ueber Emanium". Berichte der Deutschen Chemische Geselschaft (in German). 38 (1): 775–778. doi:10.1002/cber.190503801130. ↑ Kirby, Harold W. (1971). "The Discovery of Actinium". Isis. 62 (3): 290–308. doi:10.1086/350760. JSTOR 229943. 1 2 Adloff, J. P. (2000). "The centenary of a controversial discovery: actinium". Radiochim. Acta. 88 (3–4_2000): 123–128. doi:10.1524/ract.2000.88.3-4.123. 1 2 3 Hammond, C. R. The Elements in Lide, D. R., ed. (2005). CRC Handbook of Chemistry and Physics (86th ed.). Boca Raton (FL): CRC Press. ISBN 0-8493-0486-5. ↑ Gilley, Cynthia Brooke; University of California, San Diego. Chemistry (2008). New convertible isocyanides for the Ugi reaction; application to the stereoselective synthesis of omuralide. ProQuest. p. 11. ISBN 978-0-549-79554-4. ↑ Reimers, Jeffrey R. (2011). Computational Methods for Large Systems: Electronic Structure Approaches for Biotechnology and Nanotechnology. John Wiley and Sons. p. 575. ISBN 978-0-470-48788-4. 1 2 3 4 Stites, Joseph G.; Salutsky, Murrell L.; Stone, Bob D. (1955). "Preparation of Actinium Metal". J. Am. Chem. Soc. 77 (1): 237–240. doi:10.1021/ja01606a085. ↑ Richard A. Muller (2010). Physics and Technology for Future Presidents: An Introduction to the Essential Physics Every World Leader Needs to Know. Princeton University Press. pp. 136–. ISBN 978-0-691-13504-5. ↑ Katz, J. J.; Manning, W M (1952). "Chemistry of the Actinide Elements Annual Review of Nuclear Science". Annual Review of Nuclear Science. 1: 245–262. Bibcode:1952ARNPS...1..245K. doi:10.1146/annurev.ns.01.120152.001333. 1 2 3 Farr, J; Giorgi, A.L. ; Bowman, M.G. ; Money, R.K. (1961). "The crystal structure of actinium metal and actinium hydride". Journal of Inorganic and Nuclear Chemistry. 18: 42–47. doi:10.1016/0022-1902(61)80369-2. ↑ Sherman, Fried; Hagemann, French; Zachariasen, W. H. (1950). "The Preparation and Identification of Some Pure Actinium Compounds". Journal of the American Chemical Society. 72 (2): 771–775. doi:10.1021/ja01158a034. 1 2 3 4 5 6 7 8 9 10 11 12 13 14 Fried, Sherman; Hagemann, French; Zachariasen, W. H. (1950). "The Preparation and Identification of Some Pure Actinium Compounds". Journal of the American Chemical Society. 72 (2): 771–775. doi:10.1021/ja01158a034. 1 2 Zachariasen, W. H. (1949). "Crystal chemical studies of the 5f-series of elements. XII. New compounds representing known structure types". Acta Crystallographica. 2 (6): 388–390. doi:10.1107/S0365110X49001016. ↑ Zachariasen, W. H. (1949). "Crystal chemical studies of the 5f-series of elements. VI. The Ce2S3-Ce3S4 type of structure". Acta Crystallographica. 2: 57–60. doi:10.1107/S0365110X49000126. 1 2 Zachariasen, W. H. (1948). "Crystal chemical studies of the 5f-series of elements. I. New structure types". Acta Crystallographica. 1 (5): 265–268. doi:10.1107/S0365110X48000703. 1 2 3 Audi, Georges; Bersillon, O.; Blachot, J.; Wapstra, A.H. (2003). "The NUBASE Evaluation of Nuclear and Decay Properties". Nuclear Physics A. Atomic Mass Data Center. 729: 3–128. Bibcode:2003NuPhA.729....3A. doi:10.1016/j.nuclphysa.2003.11.001. 1 2 Hagemann, French (1950). "The Isolation of Actinium". Journal of the American Chemical Society. 72 (2): 768–771. doi:10.1021/ja01158a033. 1 2 Greenwood, Norman N.; Earnshaw, Alan (1997). Chemistry of the Elements (2nd ed.). Butterworth-Heinemann. p. 946. ISBN 0-08-037941-9. ↑ Emeleus, H. J. (1987). Advances in inorganic chemistry and radiochemistry. Academic Press. pp. 16–. ISBN 978-0-12-023631-2. 1 2 Bolla, Rose A.; Malkemus, D; Mirzadeh, S (2005). "Production of actinium-225 for alpha particle mediated radioimmunotherapy". Applied Radiation and Isotopes. 62 (5): 667–679. doi:10.1016/j.apradiso.2004.12.003. PMID 15763472. ↑ Melville, G; Allen, Bj (2009). "Cyclotron and linac production of Ac-225". Applied Radiation and Isotopes. 67 (4): 549–55. doi:10.1016/j.apradiso.2008.11.012. PMID 19135381. ↑ Dixon, W.R.; Bielesch, Alice; Geiger, K. W. (1957). "Neutron Spectrum of an Actinium–Beryllium Source". Can. J. Phys. 35 (6): 699–702. Bibcode:1957CaJPh..35..699D. doi:10.1139/p57-075. ↑ Deal K.A. ; Davis I.A. ; Mirzadeh S.; Kennel S.J. & Brechbiel M.W. (1999). "Improved in Vivo Stability of Actinium-225 Macrocyclic Complexes". J Med Chem. 42 (15): 2988–9. doi:10.1021/jm990141f. PMID 10425108. ↑ McDevitt, Michael R.; Ma, Dangshe; Lai, Lawrence T.; et al. (2001). "Tumor Therapy with Targeted Atomic Nanogenerators". Science. 294 (5546): 1537–1540. Bibcode:2001Sci...294.1537M. doi:10.1126/science.1064126. PMID 11711678. ↑ Borchardt, Paul E.; et al. (2003). "Targeted Actinium-225 in Vivo Generators for Therapy of Ovarian Cancer" (PDF). Cancer Research. 63 (16): 5084–5090. PMID 12941838. ↑ Ballangrud, A. M.; et al. (2004). "Alpha-particle emitting atomic generator (Actinium-225)-labeled trastuzumab (herceptin) targeting of breast cancer spheroids: efficacy versus HER2/neu expression". Clinical Cancer Research. 10 (13): 4489–97. doi:10.1158/1078-0432.CCR-03-0800. PMID 15240541. ↑ Nozaki, Yoshiyuki (1984). "Excess 227Ac in deep ocean water". Nature. 310 (5977): 486–488. Bibcode:1984Natur.310..486N. doi:10.1038/310486a0. ↑ Geibert, W.; Rutgers Van Der Loeff, M.M. ; Hanfland, C.; Dauelsberg, H.-J. (2002). "Actinium-227 as a deep-sea tracer: sources, distribution and applications". Earth and Planetary Science Letters. 198: 147–165. Bibcode:2002E&PSL.198..147G. doi:10.1016/S0012-821X(02)00512-5. ↑ Langham, W.; Storer, J. (1952). "Toxicology of Actinium Equilibrium Mixture". Los Alamos Scientific Lab. : Technical Report. doi:10.2172/4406766.